precise thesis summary to the audience. 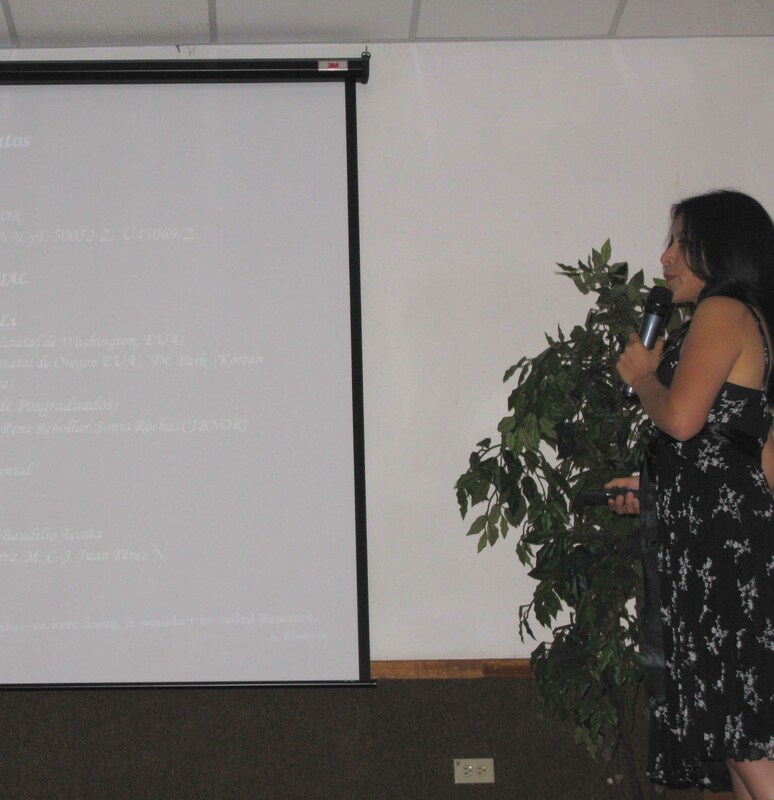 The fourth student to be partially supported by The Bashan Foundation, Blanca Romero-López, successfully defended her doctorate thesis at the Northwest Center for Biological Research (CIBNOR) in La Paz, Mexico on 21 September 2009. 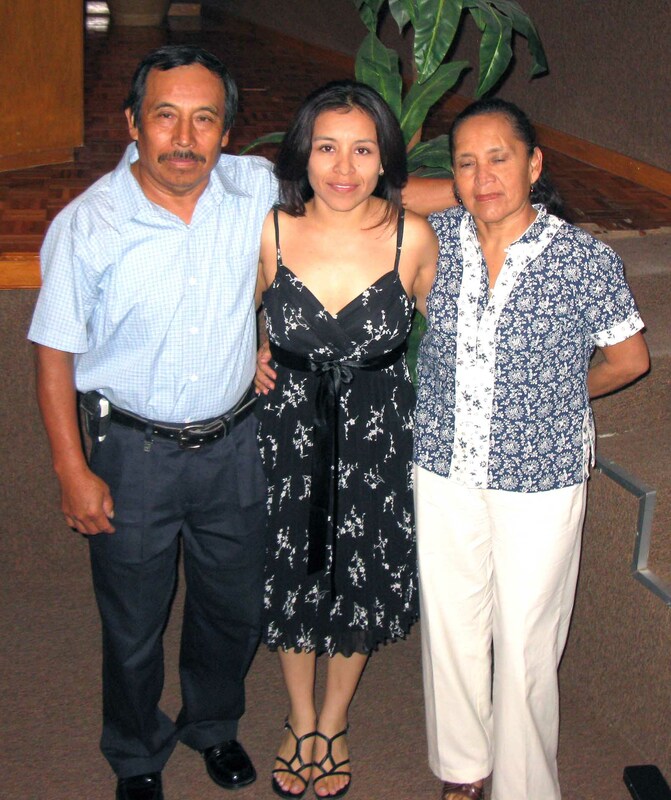 After her graduation, Blanca is currently working as a research assistant at CIBNOR, completing her publications, and working as an environmental field educator for a non-governmental organization. She intends to work abroad on a post-doctoral program in the near future. Blanca answering one of the numerous questions by the jury. They showed interest in the study. 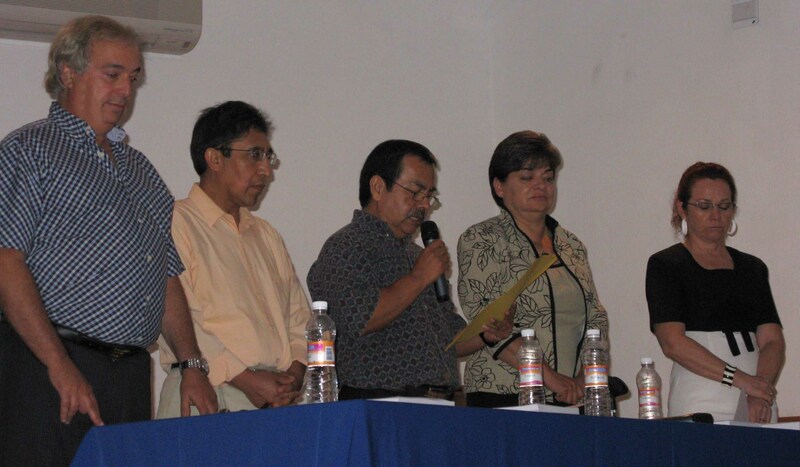 Dr. Leon de la Luz, the president of the jury, reads the approval decision. and the official requirements of the Mexican government from the new graduate. Blanca with her juries two minutes after been declared a new doctor. 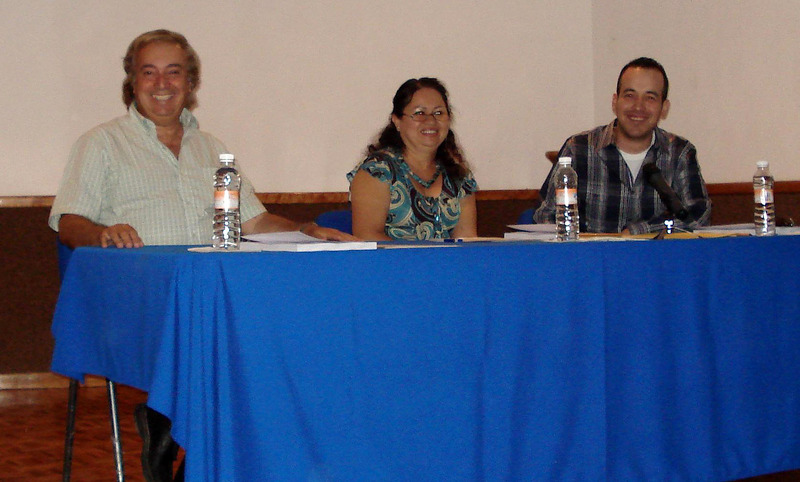 From the left: Dr. Jose-Luis Leon de la Luz, Dr. Clara Tinoco, Dr. Sara Diaz Castro, Dr. Macario Bacilio Jiménez, and Dr. Yoav Bashan. The new Dr. Blanca Romero-López with the two directors of her doctoral thesis, Dr. Macario Bacilio (L) and Dr. Yoav Bashan (R). The traditional long line of well wishers, friends, and family giving a big hug and always good words. It takes time to greet all of them. 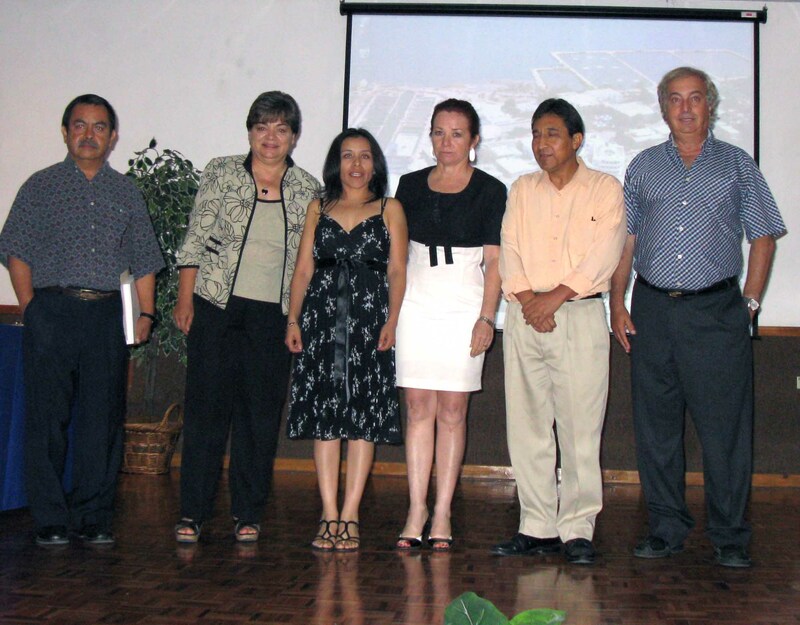 A copy of the unofficial honors certificate given to Blanca by the jury in her defense, Dr. Clara Tinoco, Dr. Sara Diaz, Dr. Jose-Luis Leon de la Luz, Dr. Macario Bacilio, and Dr. Yoav Bashan. 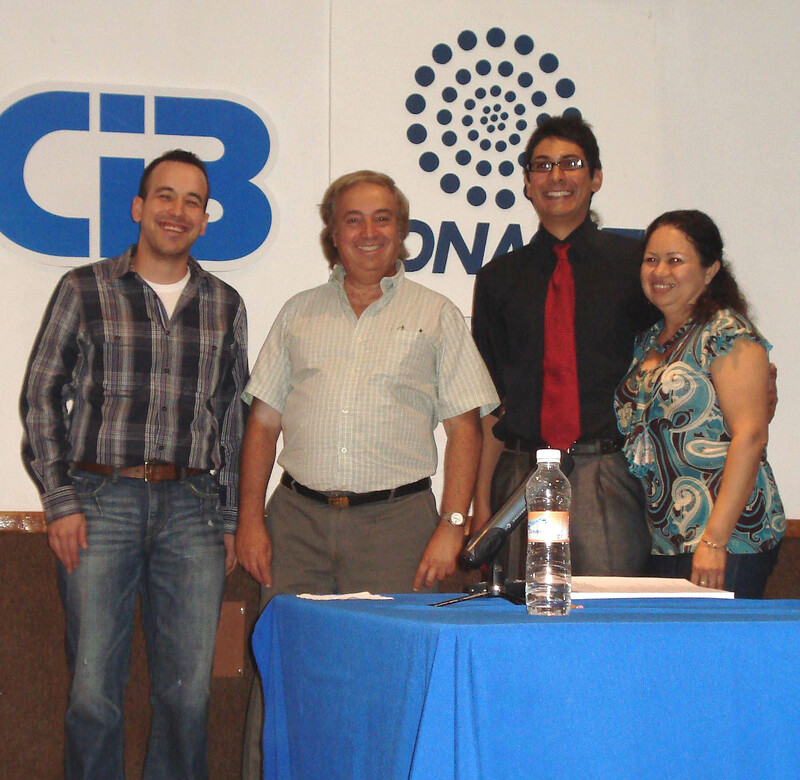 With her laboratory friends, Juan-Pablo Hernandez, Dr. Luz de-Bashan and Bernardo Salazar. Blanca with Drs. 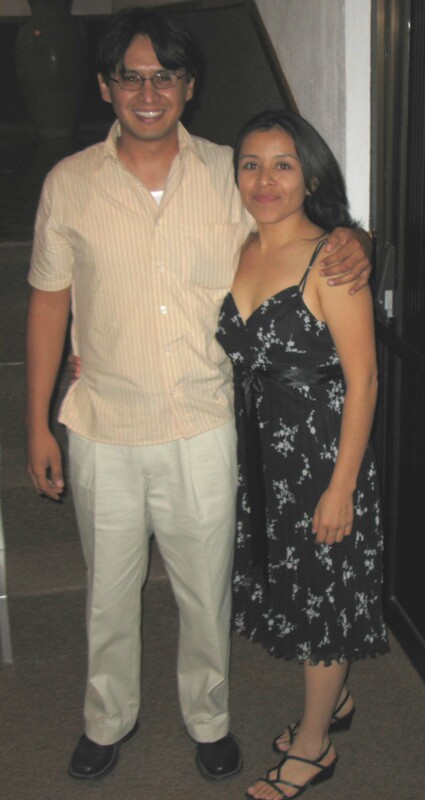 Luz and Yoav Bashan . 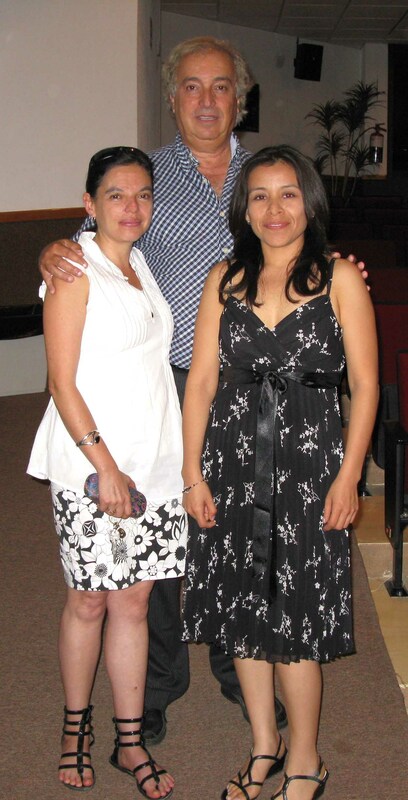 Blanca with her parents that made the long trip from Mexico City to attend the presentation and the ceremony . 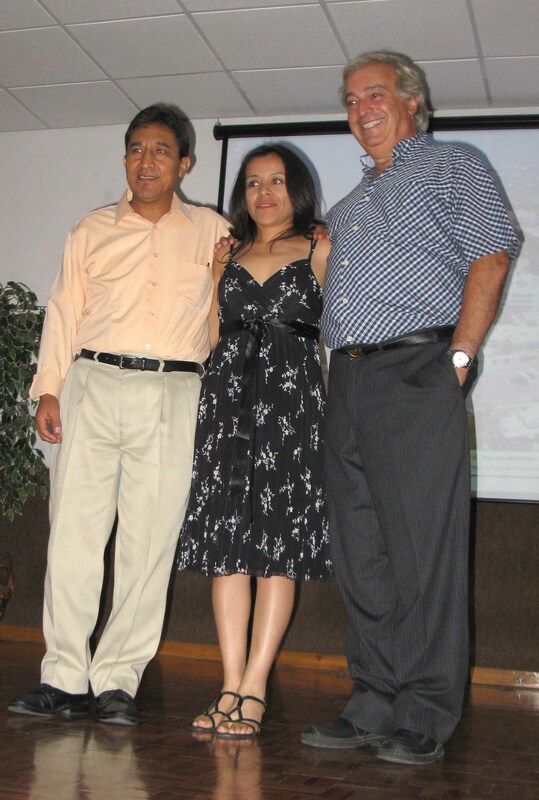 Blanca with her husband, Dr. Alfonso Medel, who graduated few months earlier from CIBNOR and quietly and continuously supported her all the way to the end. In May 2009, The Bashan Foundation had donated (downloaded) over a half-million PDF versions of research articles written by our members, the largest proportion were sent to researchers and students from less developed countries. Some articles were downloaded over ten thousand times, each. Octavio presenting his outstanding thesis presentation to the audience. 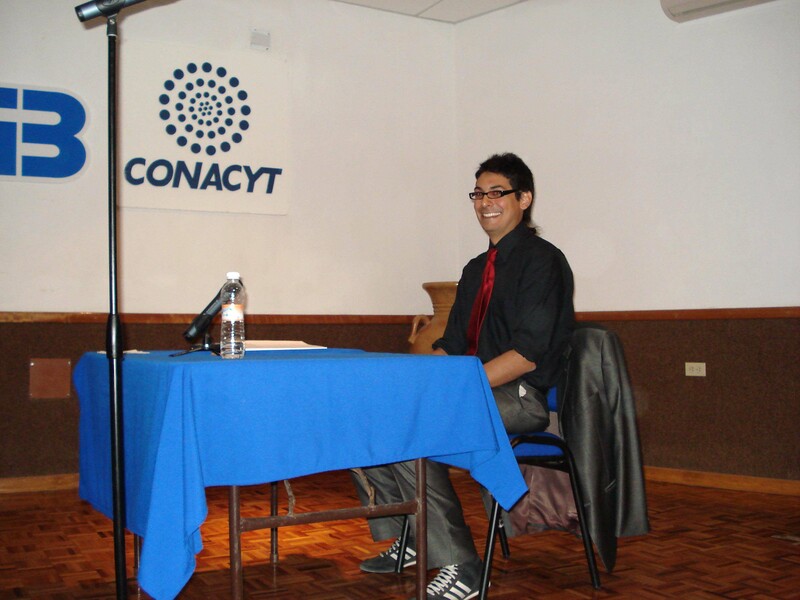 Octavio, the son of a mechanical engineer from Guadalajara, Mexico is a highly motivated student and in his free time he is the drummer of the instrumental rock band “Zenit” (http://bashanfoundation.org/zenit.html). 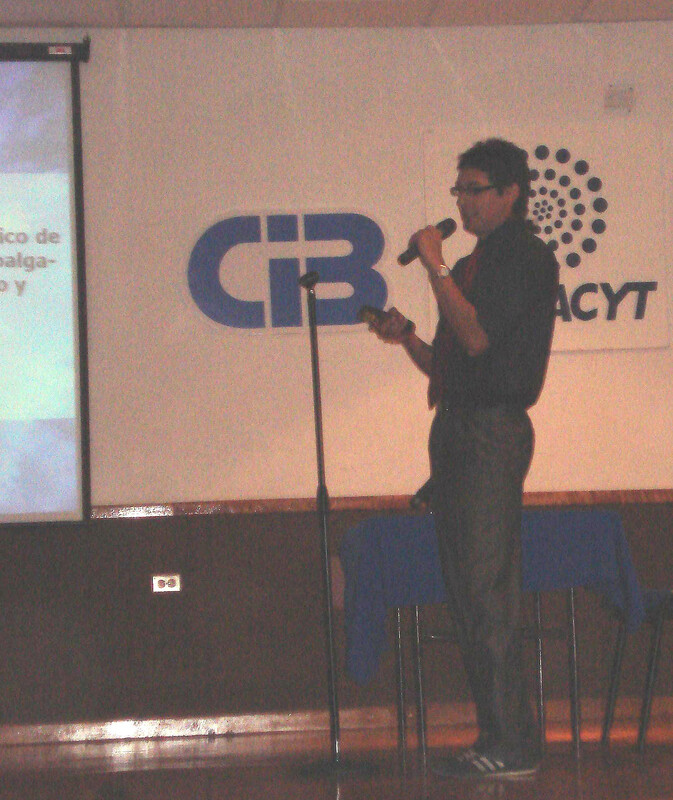 His thesis work concerned bioremediation of municipal wastewater with microalgae under dark conditions. 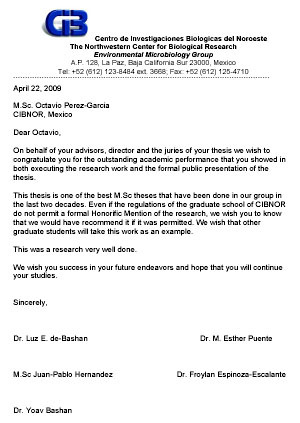 Although the graduate school of CIBNOR does not offer honors, the committee was impressed by the quality of his work and assigned him “unofficial honors”. 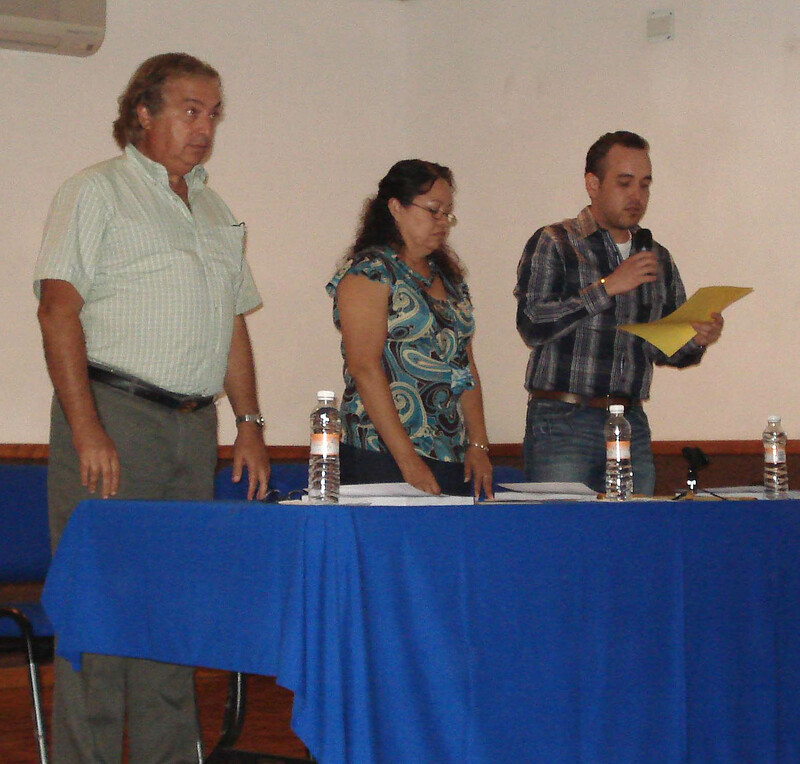 The evaluation committee listens: (From the right) Dr. Froylan Espinoza, Dr. Esther Puente, and Dr. Yoav Bashan. Dr. Espinoza reads the approval decision of the committee. One minute after the announcement. Two minute after the announcement. 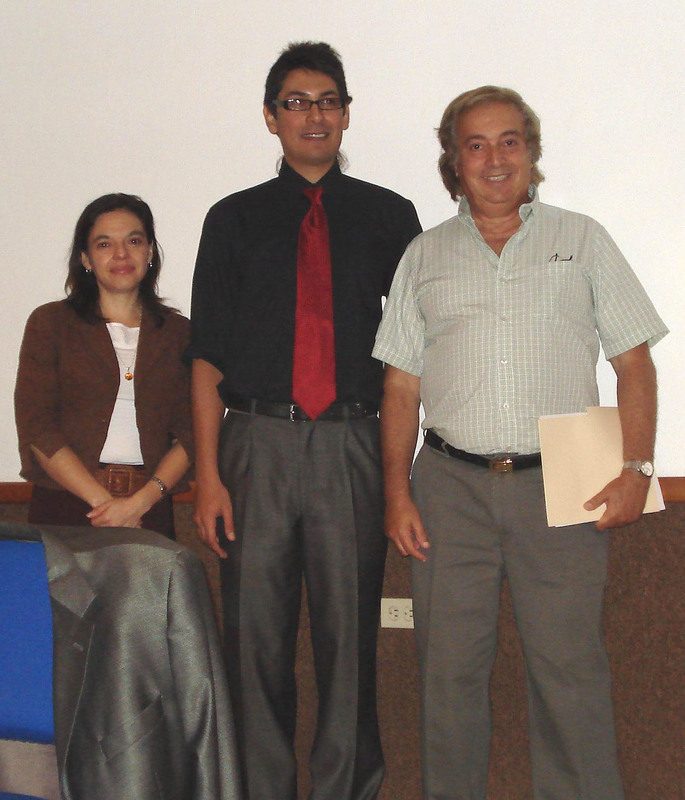 Octavio, with his “true” thesis’ director, Dr. Luz de-Bashan and the “official” director Dr. Yoav Bashan. Octavio with his lab mates: (From the right) Bernardo Salazar, Juan-Pablo Hernandez, and Adan Trejo. 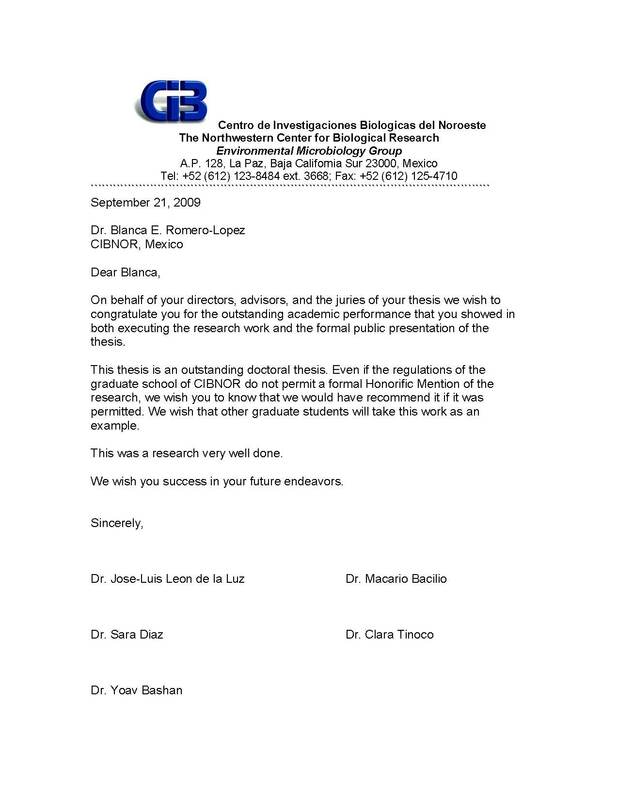 A copy of the unofficial honors certificate given to Octavio by the participants in his thesis, Dr. Luz de-Bashan, Dr. Esther Puente, M.Sc Juan-Pablo Hernandez, Dr. Froylan Espinoza, and Dr. Yoav Bashan.